At West Coast Roofing, we install many different types of commercial roofing products to ensure that we have a solution for your roof's needs. Our highly trained staff will utilize time-proven materials and installation techniques to maintain your roof's integrity for many years to come. We understand that your customers must be able to reach your front door, therefore, we will devise a plan that will keep your flow of traffic unimpeded whenever possible. We will find a way to stay out of the flow of traffic and allow you to continue business as usual. West Coast Roofing will keep you highly informed about any move we make, and will value your input as to what makes your business run more smoothly. We hear horror stories all the time about roofing contractors who install a roof and cash the check, but when an issue arises they are nowhere to be found. Our integrity and profound belief in service after the sale means that you will never face this problem. We are not perfect, but should an issue arise, we will be there to make it right. This is just another reason West Coast Roofing is one of the best in the industry. 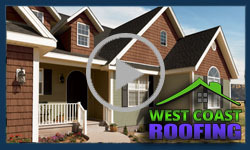 At West Coast Roofing, our installers have been thoroughly trained to install many systems. We maintain our skills by utilizing training techniques that keep up apprised of the latest standards and installation requirements. You can rest assured that your roof will be installed with integrity, utilizing skilled craftsman who care about the quality of every roof they install.